Hello! 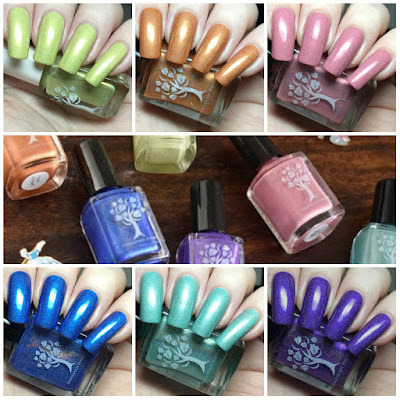 Today I have swatches of Danglefoot Nail Polish's Fairytale Collection, which releases tonight. This six piece collection is the revamped version of Hayley's older Once Upon A Time collection. All six polishes have a soft, shimmery, holographic finish. I surprisingly don't have any of the older shades, so I'm really happy that Hayley is rereleasing them. Read on for my full swatches and more info! 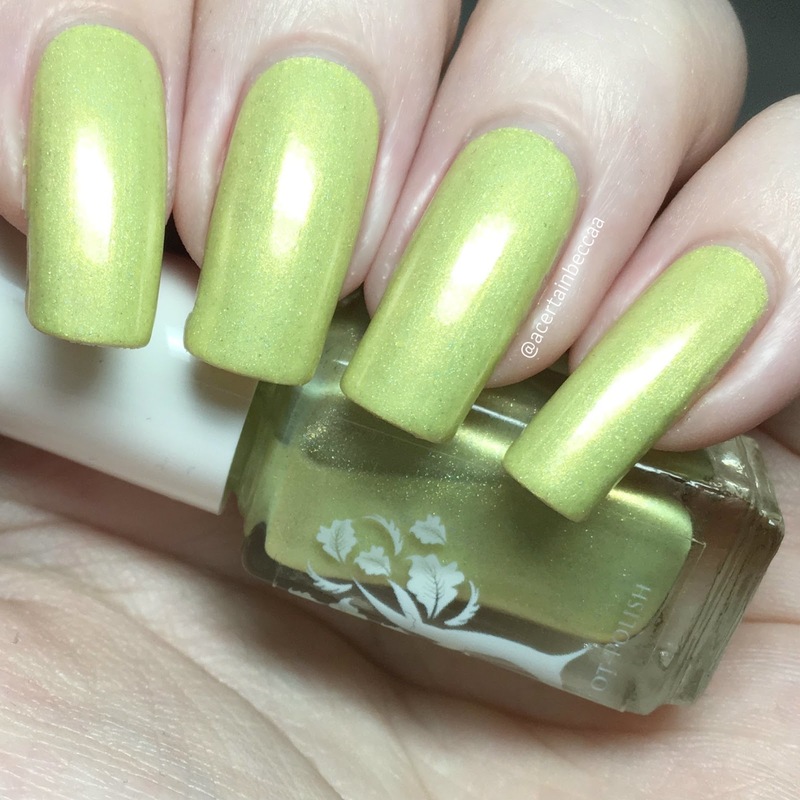 'Cast a Spell' is a soft shimmery yellow holographic. This has a bit less holographic than the others to avoid giving it a grey cast. It has a smooth, easy to apply formula. Being a yellow it does start streaky, but builds up nicely. I did need a third coat, although those with shorter nails might be okay in two. Below is three coats with topcoat. 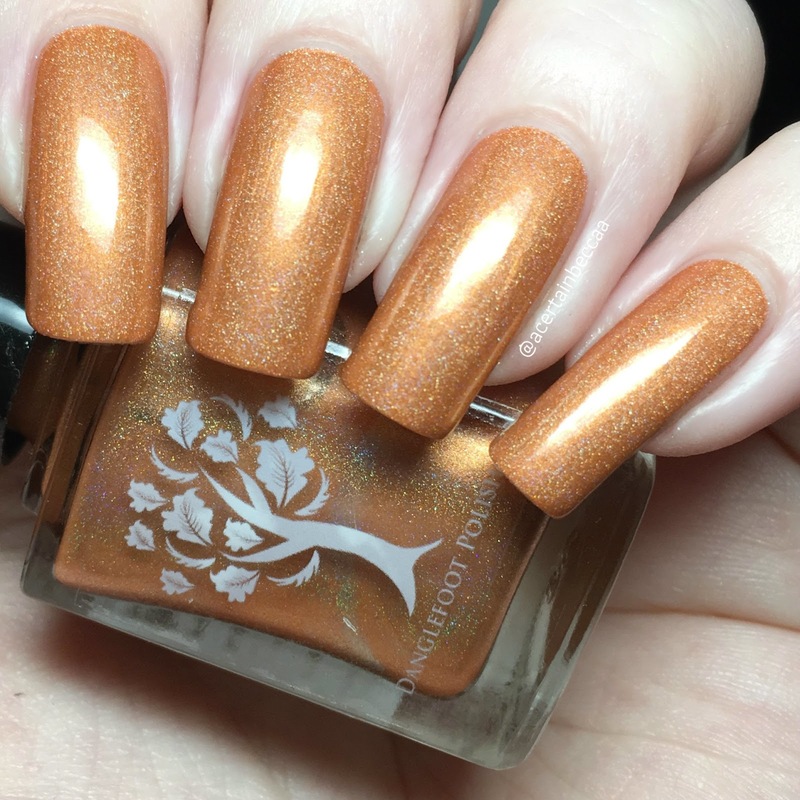 'True of Heart' is a coppery orange holographic. The formula is super smooth and easy to apply. It is very slightly sheer on the first coat, but covers completely after a quick second. Below is two coats with topcoat. 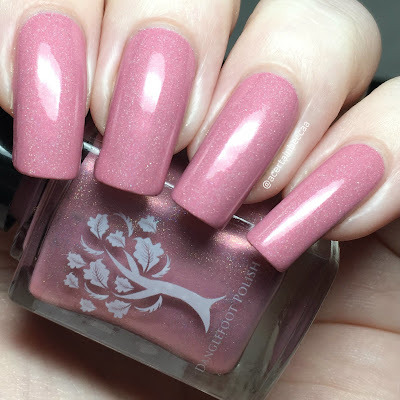 'True Loves Kiss' is a soft shimmery pink with subtle holographic. It has a lovely, smooth, easy to apply formula. Being a lighter colour it does start off slightly streaky, however a second coat easily evens everything out and brings it fully opaque. Below is two coats with topcoat. 'Until Midnight' is a royal blue holographic. It has a lovely formula, and is one of the more opaque polishes in the collection. I did need two for full opacity and to deepen the colour fully, but you may be able to get away with one thick coat if you're careful. Below is two coats with topcoat. 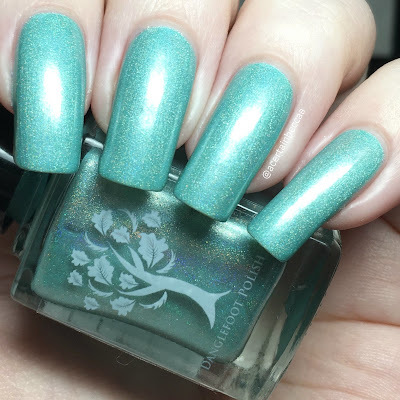 'Happily Ever After' is a soft mint holographic. The formula is smooth and easy to apply. Like the other lighter shades, this does start off a bit sheer and streaky on the first coat. I did expect to need a third coat, but it built up completely with a second. Below is two coats with topcoat. 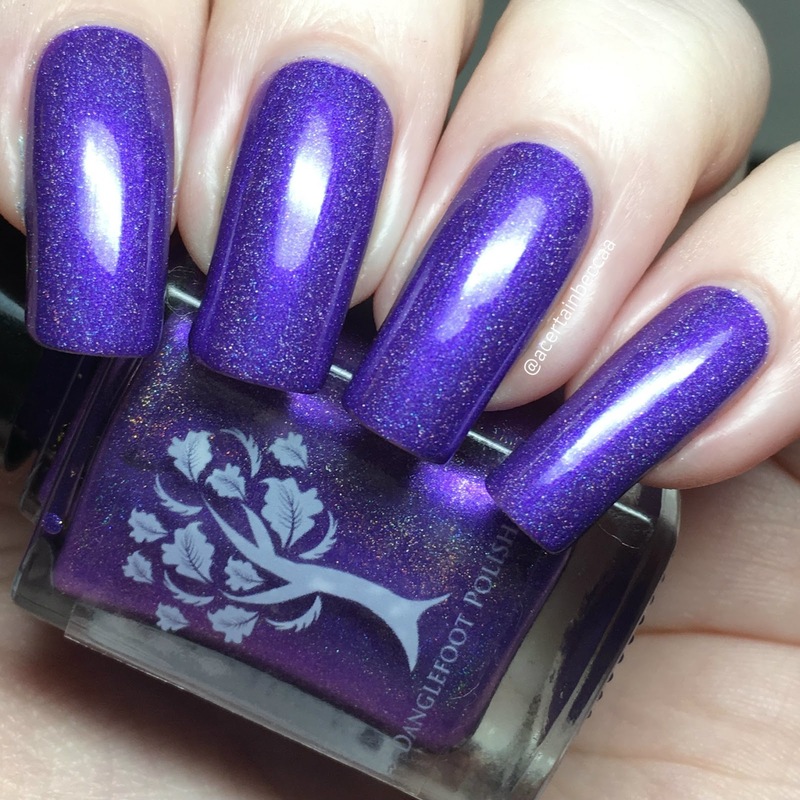 'Prince Charming' is a rich royal purple holographic. It has a smooth, easy to apply formula. Similar to 'Until Midnight', this has really good coverage on the first coat. A second covers any lighter patches, deepens the colour, and brings it fully opaque. Below is two coats with topcoat. What do you think? I just love all of these! I really do like the finish. I'm finding it quite hard to pick a favourite, but the soft shimmery holographic works so well with the royal blue of 'Until Midnight' and purple of 'Prince Charming'. Although saying that, I really like the softer shades - see, you need the lot! The Fairytale Collection will be available from 7pm tonight on the Danglefoot Nail Polish website here. Hayley is offering the full collection for £36 with free postage, or £32.50 posted without the yellow.